Sympathy Gifts For Children & Families: Meaningful & Helpful - So Festive! Looking for perfect sympathy gifts? Want to give something other than flowers? These meaningful sympathy gifts were my favorite ones I received when my mother died when I was 15. When I was just 15 years old, my mom (the reason I started this blog) passed away from cancer. Her death came all too fast. None of us were expecting it. I was just a teenager d at the time and to say my life was turned upside down is an understatement. However, I am still humbled to look back and see the generosity and love pour out from wonderful friends, neighbors, and even strangers. Receiving their kind gifts and thoughtful acts helped me and our family get through that first year. Because that first year was definitely the hardest. No matter how many years go by since then, I still vividly remember that Spring of 2001. Memories of the thoughtful gifts and acts of kindness are never forgotten. Having gone through it, I’ll tell you some of the sympathy gifts we received that meant the most. They meant the most because I still remember them to this day. One of my mom’s close friends spent a few weeks gathering and compiling memories from those that knew her. These memories came from neighborhood friends, teachers, extended family members, and others who knew her. I am humbled to think of all the time she spent collecting, typing, formatting, and printing this book for each of my family members. To this day, this memory book is one of my most cherished possessions. We received that memory book just a month after my mom passing away, on Mother’s Day. That first Mother’s Day was very hard, but having someone think of us was incredibly thoughtful. 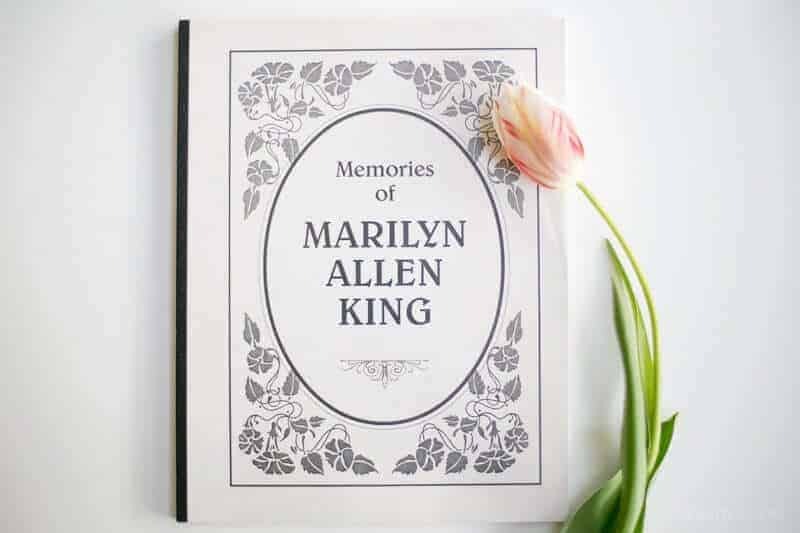 I still pull out that book of memories on her birthday or anytime I want to share stories with my husband or children. What I really loved about this sympathy gift is that a lot of the stories in the book were things I had never heard before about my mom. 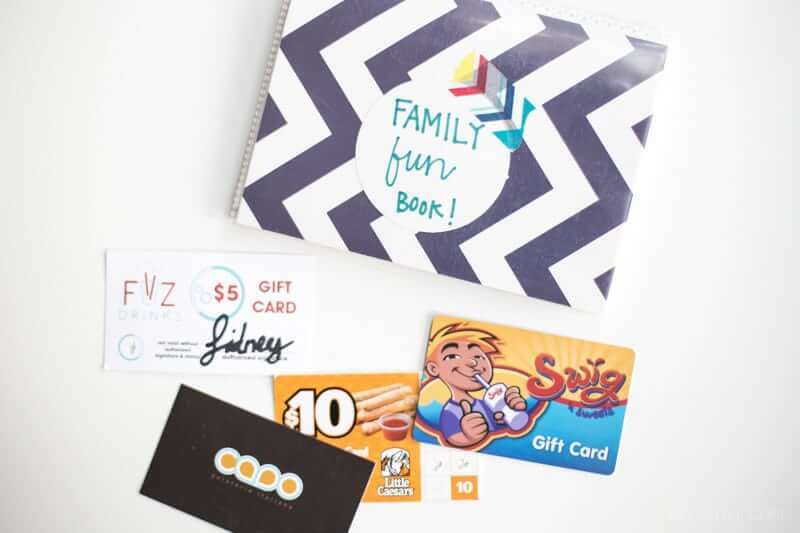 A Family Fun Coupon Book was our favorite -at least from us kids’ perspective! When my mom passed away, there were 6 kids under 17 still at home. So you can imagine the burden that my dad must have felt to suddenly have to take on all the extra tasks my mom would normally do. We all tried to pitch in and help with dinner, dishes, and laundry, but we all felt the stress from our new situation. A few of my dad’s co-workers created a Family Fun Coupon Book and gave it to us a few weeks after the funeral. This 4×6 photo album was full of gift cards or tickets to local eateries, pizza shops, ice cream shops, movie theaters, etc. We used these gift cards a lot those first few months when none of us felt like cooking and we needed to get out of the house. This super thoughtful gift not only reduced stress by not having to cook, but it helped us create some family bonds together during those really rough months. This coupon book lasted us almost an entire year and was one of our most favorite family gifts. Grab a 4×6 photo book from Walmart, Target, or your favorite drug store. Depending on your budget, decide how many gift cards you want to give. Ask other friends and family to contribute, too! You could get smaller amount gift cards so you can fill the album easier. One of my mom’s walking friends in our neighborhood brought each member of my family a journal. She told us that while memories were still vivid, we should record any thoughts and feelings we were having. I still look back through this journal and cherish what I recorded. Plus writing down thoughts and feelings in the moment of healing can be very therapeutic. Giving a new notebook or journal is one of my favorite sympathy gifts to give someone! I really love these simple and classy journals that come in all different colors. Giving some comforting music is also a good sympathy gift idea. Music can be so powerful throughout the grieving process. Peace Like a River was my favorite CD I received because the songs were calming and comforting. I remember listening to that music every night when I fell asleep. A really close group of friends gave me a huge, super soft blanket and a giant teddy bear. When I felt alone and sad, especially during those first few months, I loved having something cuddly to snuggle with. 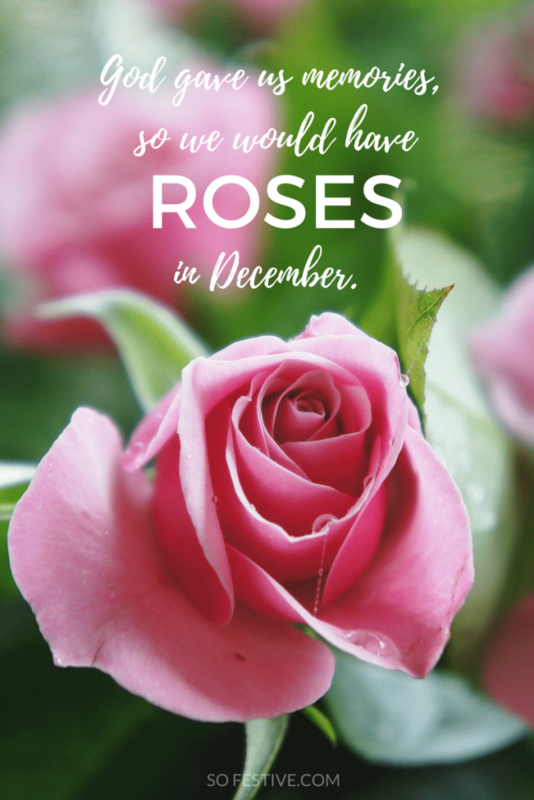 Another friend gave me a blanket with an embroidered quote that said, “God gave us memories so we’d have roses in December.” That quote is one of my favorites to this day. I will often share that with others who are experiencing sad moments because of death. Having been on both sides, it’s hard knowing what to say to someone who has just lost a person very close to them. And it’s also hard to ask for help. It’s human nature to say, “Let me know if you need anything”, but honestly, it’s really hard sometimes to call someone up and ask for a meal or a favor. Instead of saying “Let me know if I can help with anything”, try saying, “What is something I could do to help you?” Even better, try and think of a need they might have and offer to help with that specific thing. If none of the above gift ideas sound like a good fit, don’t forget the simple ones. A card, flower bouquet, text, or email will still make a difference. When someone loses someone they love, the thought really does count. And it counts big! Tip: Flowers are a very popular gift. While they are appreciated, consider giving flowers a few weeks after the funeral on a special day like a holiday or just-because. Flowers received at the funeral tend to carry the memory of the death with them, while flowers later on may seem happier. Anything is better is nothing. Just remember, it’s not always easy to know what to say or give, but from experience, I will say that doing anything is better than nothing. Those thoughtful gifts and acts of kindness you give will not be forgotten. Be there for anyone who is going through something hard. They will appreciate it! Those are great ideas Melissa! Thanks for sharing something so personal. You are her living legacy and I know she is so proud of all that you are. This is a beautiful list. That must have been so so hard to say good-bye to your mom at such a young age….I feel like I know her though, through you and Em and how kind, loving, sweet, thoughtful, and festive you all are <3 She sounds like a very wonderful person! I remember my sister saying some of these similar things were helpful when her little girl died last year. Sometimes it is also great to have people who just simply mourn with you….not tell you what to do, but sit with you, cry with you, and mourn with you.